(PantherMedia / Lorenz Timm) Scarlet fever is a bacterial infection that mainly affects children. It usually causes a typical rash, fever and a sore throat. Thanks to antibiotics like penicillin, scarlet fever is easy to treat. Antibiotics can also reduce the time during which children with scarlet fever are contagious. The infection is spread through bacteria-containing droplets and close physical contact. Before the development of penicillin, scarlet fever sometimes led to serious complications. But it’s usually quite a mild illness nowadays. It’s still important to try to stop it from spreading to other people, though. One thing you can do is wash your hands often. Unlike with many other childhood diseases, having had scarlet fever in the past doesn't make you immune to future scarlet fever infections. So people can have it more than once in their lives. A rash that doesn’t itch usually starts breaking out two days after infection. The rash consists of many small spots that turn from pink to red. It may spread from the torso to the neck and then the hands and feet within a few days. But it usually doesn’t affect the skin below the nose and around the mouth, or the palms of your hands or soles of your feet. The rash is often especially visible in the groin and armpit area. The spots disappear after about a week. In the second, third and fourth weeks the skin starts to flake off, especially on the palms of the hands and fingertips and on the soles of the feet and the tips of the toes. Sometimes the symptoms of scarlet fever are quite mild, and may only include a bit of a sore throat, a moderate temperature and mild rash. But sometimes people develop a severe sore throat, high temperature and a worse rash. Scarlet fever is a bacterial infection caused by a strain of Streptococcus bacteria called “Streptococcus pyogenes” or “Group A Streptococcus” bacteria. Streptococcal infections typically only lead to a suppurative (pus-producing) inflammation of the tonsils and throat, commonly known as “Strep throat.” The particular strains that cause scarlet fever also produce a toxin that leads to the typical rash. These bacteria are typically spread through droplets, for example in saliva or when people cough or sneeze. Scarlet fever is much more common in children than in adults, and it mostly affects five- to twelve-year-olds. Unlike with many other childhood diseases, people can have scarlet fever several times in their life. About a quarter of all teenagers have already had scarlet fever at least once. Scarlet fever is often a mild illness, even without any treatment – but there is a small chance that the infection could spread to other parts of the body and cause more severe illnesses. The middle ear or tonsils can become infected and produce pus. Another possible complication of scarlet fever is rheumatic fever, where various joints or organs (e.g. the heart or kidneys) become inflamed. But nowadays these more severe complications are much less common in Germany and other countries than they used to be. In very rare cases, germs get into wounds. This can be dangerous because the bacteria can then enter the bloodstream and cause sepsis (blood poisoning, also known as septicemia). Although these kinds of serious complications are rare, they can be life-threatening. Taking antibiotics will usually make the symptoms of scarlet fever go away within a few days. People who take antibiotics are also no longer contagious after 24 hours. Those who don’t take antibiotics are contagious for up to three weeks. Doctors can usually diagnose scarlet fever based on its characteristic symptoms. 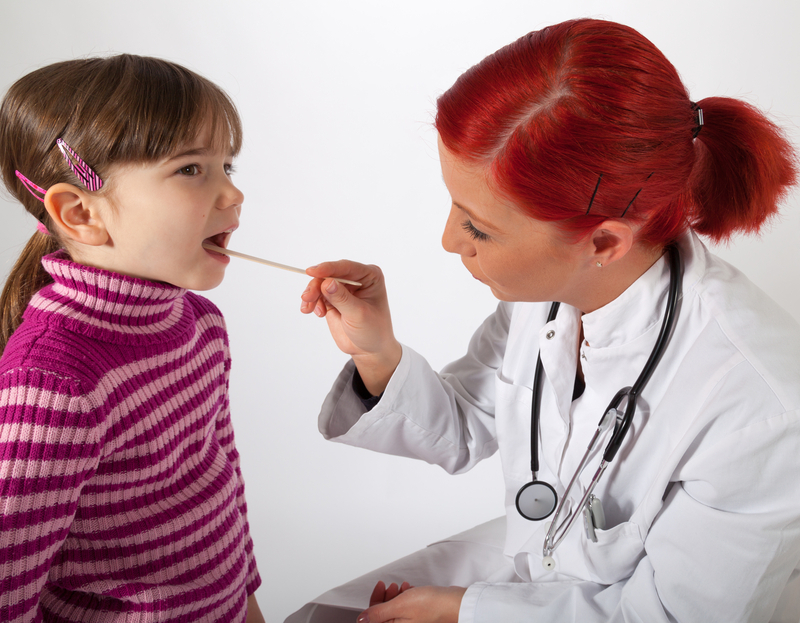 They often do a quick test known as a "rapid strep test" too, which lets you know whether it’s scarlet fever within a few minutes. The test involves taking a throat swab and checking it for Streptococcus bacteria. But the outcome of this test isn’t always reliable. If Streptococcus bacteria are found, you can be quite sure that they are causing the symptoms. But if nothing is found in the sample, you still can’t be sure that there are definitely no Streptococcus bacteria present. A sample can then be taken from the tonsils and sent to a laboratory to get more accurate results. It takes about one or two days for those lab results to come back. There is no scarlet fever vaccine. But it’s a good idea to take the same kind of general precautions you would take to avoid colds or respiratory infections. These include washing your hands often and avoiding close contact with anyone who has scarlet fever and might still be contagious. A lot of children carry scarlet fever germs in their throat without getting ill, especially in the winter. These children are usually not contagious, even if they are shown to have the germs. So there’s no need to take measures to prevent infection in those cases. Scarlet fever is treated with antibiotics – also because that means you will no longer be contagious after 24 hours. They make the symptoms go away a little faster and help to prevent possible complications too. The most commonly used antibiotics for the treatment of scarlet fever are penicillin-based. They are taken two or three times a day for ten days. If someone is allergic to penicillin or it is not well-tolerated, they can take other antibiotics. The possible side effects include nausea, diarrhea and a rash. It’s important to keep taking all the antibiotics even if your symptoms have already gone away. That’s the only way to make sure that all of the germs are killed. Symptoms like a sore throat or fever can be relieved by taking medicine such as ibuprofen or acetaminophen (paracetamol). Other things that may have a soothing effect include sucking throat lozenges, drinking tea or using home remedies such as neck wraps. Scarlet fever is one of the diseases covered by the German law on the prevention and control of infectious diseases (Infektionsschutzgesetz). This means that, according to German law, someone who is thought to have scarlet fever must stay away from places where they would come into contact with others. For instance, children who are thought to have scarlet fever are not allowed to go to daycare or school and should not play with other children. Adults who have scarlet fever (or are thought to have it) aren’t allowed to do any jobs that involve contact with other people. These include teaching, working at a daycare center or providing nursing care. People who have taken antibiotics for two days are no longer contagious and will usually already notice an improvement in symptoms. At that point they can also participate in activities involving other people again, such as going to school or work. A written note from the doctor is not needed. Bundeszentrale für gesundheitliche Aufklärung (BZgA). infektionsschutz.de. Scharlach. June 16, 2014. Deutsche Gesellschaft für Pädiatrische Infektiologie. DGPI-Handbuch. Stuttgart: Georg Thieme Verlag; 6th editiion 2013. Pichichero ME. Treatment and prevention of streptococcal tonsillopharyngitis. UpToDate. October 17, 2016. Robert Koch Institute (RKI). RKI-Ratgeber für Ärzte. Streptococcus pyogenes-Infektionen. March 12, 2009.